AMG's work on the base model provides a strong foundation for the next AMG G63. At first glance, the doesn’t appear to have changed much despite it representing the rugged SUV’s first major redesign since it launched nearly 40 years. Its boxy shape looks instantly familiar, but peel back the skin and it’s obvious that mechanics have been given a long overdue update, resulting in a markedly better driving experience. In an interview with , Mercedes-AMG head honcho Tobias Moers revealed that AMG was deeply involved with the development of the new G-Class. AMG engineered the suspension and front and rear axles, as well as the drivetrain, shaft, and knuckles. 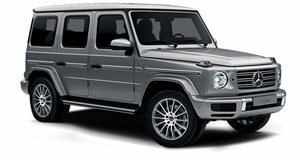 Also new to the 2019 G-Class is the addition of a new double wishbone front suspension, which is a first for the model. While adopting independent front suspension improves the SUV’s on-road performance, AMG developed tall upper wishbones that are bolted directly to the frame to maintain ground clearance. While some may argue that a solid front axle is better for handling rough terrain, Mercedes R&D boss Ola Kallenius assured that the G-Class’s off-road prowess hasn’t been compromised. Kallenius promises that the new G-Class is a “go-everywhere car” and “the pinnacle of SUVs” when it comes to off-road performance. He also added that the SUV’s on-road performance is significantly improved too thanks to new electric power assistance replacing the old G-Wagon’s archaic recirculating ball steering. "When you take a car where the base concept has stayed more-or-less the same for 40 years, and you get the chance to redo everything, then you just look at what's state of the art," he said. Moers added that AMG's work on the base model provides a strong foundation for next AMG G63, will arrive sooner than later according to the company boss.